Tomorrow we celebrate our country’s birthday – the day we declared our independence. So I’m declaring my own kind of independence. I’m claiming freedom from the feelings of guilt, fear and insecurity that often steal my joy. My independence doesn’t come through denial or ignorance – instead it comes from the freedom of knowing I am not alone, that God is with me and I can find comfort in knowing perfection is not a prerequisite for effective parenting. Need more proof that this kind of independence is possible (and dare I say it – NECESSARY!?) Look no further than the most fantastic, hilarious, well-organized and applicable book for moms looking for guidance instead of guilt. Get ready to enjoy a time of hope and help as we declare our independence from anything that is not of God. 2. Throughout the book Kathi provides Scripture and specific prayers I can pray for myself and for my children – it’s an amazing resource! The best part is that the prayers and Bible verses are organized according to situations that are bound to occur in all our lives. 3. I loved reading all the testimonials and personal stories from moms who did everything “right” and yet their children decided to do wrong. I was amazed by these women’s honesty and their willingness to share how they found hope in the midst of despair. 4. When talking about how we feel powerless due to our children’s bad choices, Kathi writes about it being painful and how it takes time to recover but, “we haven’t put our trust in our child’s choices. We’ve put our trust in the Rock” – YES! 5. Each of my children are unique and while I love that fact I sometimes hurt for them when they don’t fit in with their peers or the world’s expectations. Kathi challenges us to change our prayer from “Lord, help them be enough” to instead praying: “Lord, BE their enough.” Wow – I’ll admit it – I have that statement written on a notecard and taped to my bathroom mirror. I guess we could use that statement too. If GOD is our “enough” we won’t have room to second-guess, fret or stew about whether or not we’re good or bad moms. Instead, we’ll just keep reveling in God’s hope and enjoying the help we receive from our fellow moms who are (as Kathi puts it) in the trenches with us. I am so excited to share this book with you and I know you’ll enjoy each part of this challenging and honest look at parenting. I’d encourage you to read it with other friends or even out loud with your husband – every piece of this book is something we’ve either been through, are dealing with or will some day encounter. No one is immune to life. If you have your own story about finding hope during a troubling time we’d love to hear it. Thank you for being honest and allowing God to use your life to encourage others! Let the hope-filled days begin! Let The Summer Planning Begin! I have been incredibly blessed to work with some of the most gifted, amazing women as I’ve journeyed through this world of speaking and writing. A woman I truly admire and respect is Kathi Lipp. She. Is. Hilarious! She is real, she is honest and she is so encouraging. I also love her ability to take real life and then give us real solutions and ideas. 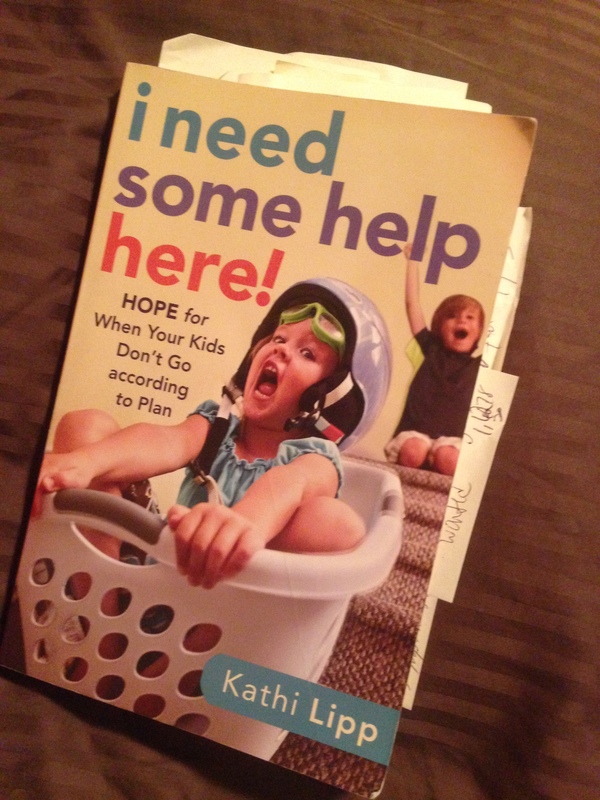 Because I love all of you and know you are in the same boat as me – I can’t wait to share Kathi’s FREE book with you!!!! Just click on the picture below to have Kathi’s latest book, “Surviving Summer Vacation”, emailed to you today! Leave a comment below with your best summer activity and favorite activity to help the summer days be fun and full of wonderful memories! Summer and warm weather are coming – let the planning and celebrations begin! Here’s a post I wrote 2 years ago about Lent – reading it now I have to laugh. James was 5 at the time. He is now 7. We haven’t talked about what we’re giving up for Lent – it’s been a crazy season of life. This weekend will be a time of talking, praying and hearing from our boys and what God is going in their hearts. 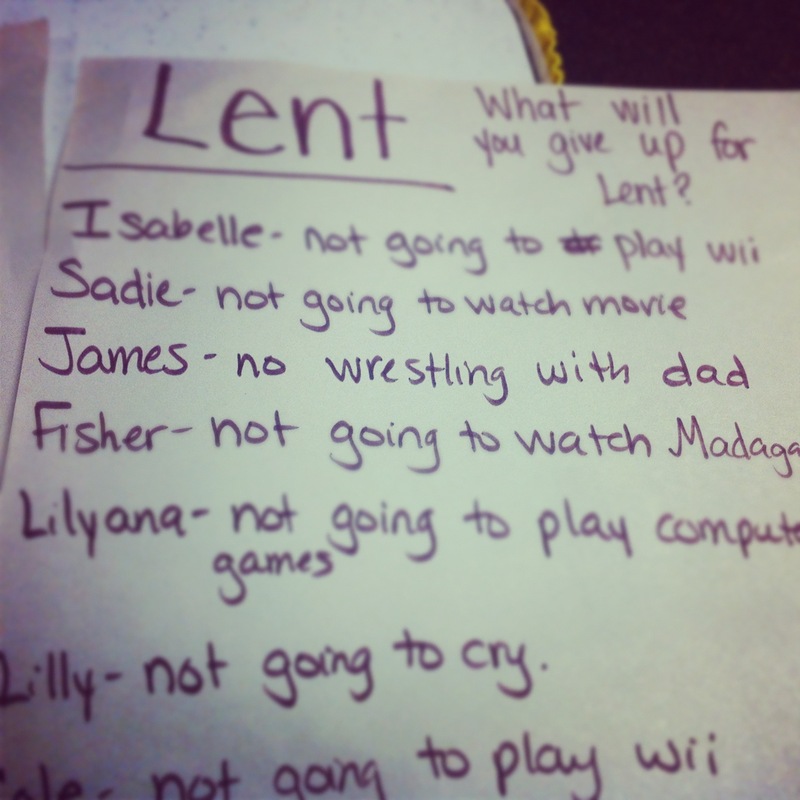 How do you talk to your kids about lent? Are your kids or family giving up something in particular? Some of you have commented on Facebook, sent a Tweet or sent us emails asking about how and when children should be involved in this tradition and how to explain Lent to them. I’m so glad you asked because I was struggling with the same issues just yesterday! I picked up our son, James, from preschool and saw a paper laying on the table outside their classroom door. The teachers had obviously explained Lent and asked children what they would give up during these 40 days of remembering Jesus. I was shocked to see James’ answer – he was going to give up wrestling with his Dad!?!?! That’s his most favorite thing in the world to do! M: Did you guys talk about Lent today with Ms. Kristen and Ms. Lynn? M: Well, what did you learn? J: We were suppose to pick something to give up and I said I’d stop wrestling with Dad for the next 40 years because I usually get hurt when we wrestle with the other boys anyway, so I thought that’d be a good thing to give up. M: Do you know why you are giving up wrestling with Dad? M: How about I tell you more about Lent and how Daddy and I observe it and then maybe we can talk more about what you want to do – would that be okay? M: What do we celebrate at Christmas time? M: That’s right! Jesus made a choice to leave His home, Heaven, and all his angel friends and even His Father – God. He gave it all up so He could come here to earth and save you and me. That’s a pretty awesome sacrifice don’t you think? J: Yeah – I wouldn’t want to leave you guys and go anywhere! I’d miss all my toys and my bike. M: I know, that would be so tough! You don’t have to leave us or your bike. But Lent is a time when we think of something “extra”. Think of something in your life that you really enjoy eating or drinking or doing – but remember it needs to be something extra…can you think of anything? M: Something extra in my life would be sweet treats, coke zero, even watching certain TV shows….I really enjoy all those things but if they weren’t in my life I’d still be okay wouldn’t I? M: So, during Lent we choose something extra, something we enjoy, and we give it up for 40 days. Then every time we want to drink a coke or watch a show or eat a sweet treat we remember what Jesus gave up. He gave up Heaven for you and me! Giving something up is simply a way to help us remember and help us keep a thankful spirit. You don’t HAVE to give anything up, but it’s kind of a cool challenge. Whatever you give up gets to come back in your life on Easter morning – just like Jesus was able to go back home to Heaven on Easter morning! J: Ohhhh Okay, I think I got it. You know what I really like? Sprite. I think I want to give up Sprite instead of wrestling with Dad. M: Babe, I think that’s a great idea – do you want to give up drinking anything that has those bubbles in it and only drink milk, juice and water? Or you could just give up Sprite – whatever you want to do. J: I think I want to give up everything with the bubbles in it (pause) and Mom, I think you should give up drinking Coke too. We can do it together! M: (with a slightly false, begrudging tone) I think that’s a great idea! We’ll do it together. So every time we want to order a Sprite or Coke at McDonald’s or want to drink it at home we’ll remind ourselves that Jesus gave up Heaven and we’re giving up that drink. We were eating lunch during this conversation and BOTH of us had a carbonated beverage as our drink. James suddenly had a look of horror on his face like he’d broken a rule or messed up already. I assured him that today we could drink as much coke and sprite as we wanted – Lent didn’t start until tomorrow. And now that He had me committed to no Coke I educated him concerning the Western Church’s view of Sundays during Lent. He was very excited to hear we could have Coke and Sprite on Sundays because they represent the resurrection. In fact, if you count from Feb. 22 (Ash Wednesday) through April 8 (Easter) there are 46 days. Lent is a forty-day period because we don’t count the Sundays. I know for some people it’s more about a complete surrender and removal of a task so perhaps skipping Sundays isn’t something you would like to observe and that’s fine – each person needs to observe Lent in their own way. * Instead of watching television or playing video games in the evening, decide to read sections of scripture that describe Jesus’ ministry and life. Following His journey to the cross makes the week before Easter and Easter morning even more amazing. * Perhaps your child gives up a favorite toy or activity for a day. During that day, help them remember WHY they are giving up that particular thing. * Instead of buying new clothes, commit to getting rid of clothing that isn’t being used or doesn’t fit and give it to a local charity. * Instead of watching TV, sit down and write letters to missionaries (your church will have a list of names and addresses) and thank them for helping others know about Jesus and how much He loves them. The whole point of Lent isn’t to be like the Pharisees and brag about what we’re giving up. That would be selfish and boastful. The point of Lent is to remember that sacrifice matters, discipline counts and in order to be an effective Christian we need these reminders each year so we don’t forget. Sometimes when our children watch us observe these traditions they learn as much or more than if they had participated. Never force a child to receive communion, to have ash on their forehead or give up something during Lent. To force them takes away the fundamental component to the Christian life: free will. Here are some great websites with other ideas for celebrating this season with children. Don’t worry that the “actual day” has passed. This isn’t about strict observance of particular dates and times. This is about helping our children remember how much Jesus loves them and how we respond to that love in our own life. We won’t love the things of this world so much that we can’t give them up – even if it’s for a season. We will love God and Jesus more than anything else! Have a great Lent season and please, share your stories with us in the comment box – how do you celebrate with your kids and how did they respond to the whole idea of Lent? We need to hear from you!